Those of you reading this and not in the Suffolk Global MBA, you'll remember that I am Hang, a Suffolk Global MBA from Viet Nam, in the international finance concentration. The summer went by fast. It is time for us to come back to our Suffolk University. I had a great experience at eSecLending as a Credit Risk Analyst for my Suffolk Gloal MBA internship. There are multiple positive aspects that have materialized as a result of this six of credit internship in risk analyses finishing. My colleagues are so nice to me and I have learned a lot from them as well. A special note of thanks must be given to eSecLending and Suffolk GMBA for giving me the opportunityy to work in this professional environment. It was a great experience for me. Other positive aspects of the internship have been my growing expertise in the field of credit risk analysis. The skills required to be a successful credit risk analyst include an acute attention to detail and the ability, and willingness to work with numbers and a good background in accounting and in fixed-income instruments. A number of financial data such as profitability and earnings quality, capitalization, assets quality, liquidity and funding over the past fiscal period-times and their trends over the past period-times are evaluated in comparison with its closest peers. This along with understanding the economic environment in which they operate as the global market recovers from the financial crisis and new financial regulations are put in place. In addition, I have become more exposed to the overall process of acquiring and analyzing data. I now know where significant pieces of information can be found through resources available on the Internet as well as financial data agencies such as Moodys, S&P, or Bloomberg. This knowledge is something I can take with me and apply to future Global MBA classes and to my career. I achieved my goals of learning in this internship. It is my final Blog today. Not to be forgotten: to express my gratitude to our Dean Hallberg who played an important part for giving me this experience. Also, thanks to you all for being my friends here in U.S. This wonderful time with you in Suffolk University will be always in my mind. I am looking forward to see you all soon in school. One of the reasons why I love the working life is that I can have my weekends back!! No studying to do or team meetings to attend… Just enjoy! A few weeks ago, I got a message from one of my friends from Greece saying that she and some friends are renting a sailing boat this year during their summer vacation and they are going around the Greek Islands. I got so jealous!!! So, I decided that I wanted to learn how to sail, so that she and I can do the same thing next summer. 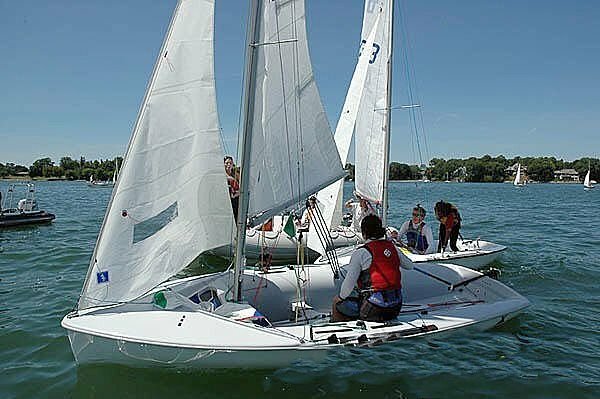 I signed up for sailing classes and today I had my first one. It was fantastic!!! They let us on the boats already and we sailed around the Charles River. It was a lot of fun and they let you figure things out on your own. This is a nice way to teach because you learn from your mistakes… like when you are stalled in the middle of the river, not going anywhere… haha!! It happened to me several times. So I will keep you all posted on my progress! You can see below the type of boat I sailed on and a few pictures of the view of the city from the Charles River! I am in Suffolk Universitys' Global MBA program, an MBA in international business and I am from Viet Nam. I have just had a long conversation with my lovely French friend. He reminded me of the amazing song called Hello Viet Nam. Marc Lavoine wrote the original song in French called Bonjour Viet Nam as a special gift to Pham Quynh Anh, a Vietnamese immigrant and a French singer as well, who never had a chance to know her home. I would like to share the song's two versions with you all. The videos show us a lot about Viet Nam from North to South. Also, in the second one, you can see white “Ao Dai”, a traditional Vietnamese long dress and “Non La”, a traditional hat. I was proud of wearing them to go to high school for a long time. I hope you like them. Can you recognize me in this picture? Hope you all will love the song like I do. How was your 4th of July? I had a great time! It was the perfect end after my summer class finished and a great chance to rest! I went to Vermont for the long weekend. On Saturday afternoon I drove up and on my way there, I stopped to take a few pictures of the Quechee Gorge. It was quite a fabulous view!! Then, on Saturday evening, I met with a few friends and we had a great barbeque. On Sunday, I hiked Shrewsbury peak. Shrewsbury Peak is a small mountain located in Rutland County, Vermont, in the Calvin Coolidge State Forest and its elevation is approximately 3600 vertical ft. The trailswere gorgeous, quite jungle-ish and toward the end, it was a tricky climb, as there was a combination of a stream and wet rocks placed on a steep incline. The view from the top, however, definitely rewarded you for your efforts! It was a great way to get some exercise as well! Later in the evening, my friends and I went downtown to watch the fireworks show. It lasted about 30 minutes and the finale was spectacular! Here are some pictures for those of you that didn't have the chance to see fireworks this year. I was glad glad that I finished the first two banks’ analysis reports in my internship. Everyone in my department has his own way of doing things but we all work together and accomplish much. My self-reward for all my work was a trip to Six Flags. I hoped to enjoy having fun with many kinds of roller coasters, which we do not have in Viet Nam. My goal was to ride ten of them. However, I was so scared right after the second thrill ride that I gave up that goal. I enjoyed iwatching my friends having fun and making noise there instead. Now I know how fast and thrilling the roller coasters in the US are. Hope you all are having fun. Just as I promised, here are some pictures of the building, the wonderful views of Boston, and my cubicle. I have prime real estate as it's a corner unit! I am sorry I have been missing-in-action, but interning at State Street Global Advisors and taking a class in the evening have been keeping me pretty busy, ALL the time! But before I begin, let me re-introduce myself since it’s been so long since I have written anything. My name is Konstantina Tsouroufli and I am a Suffolk Global MBA from Greece. I just finished my first year of graduate school doing an MBA in international business (the Global MBA), concentrating in Finance, and I am now an intern at SSgA in the Product Engineering group of the Fixed Income Division. Before I begin telling you a little bit about my experience so far, I have to admit that it’s been wonderful reading everyone’s blog and getting to experience the different cultures through your writing. You are all doing a fantastic job describing the things that are new, good, bad, interesting and exciting! I really enjoy your blogs so please, keep on writing!! So, life has been great so far…. I started on June 7th and I am already working on a global project where I have to compare strategies used in the UK with those used in the USA and create a presentation to give via videoconference to State Street offices around the world! Talk about a global experience! Besides that I am located on the 29th floor of this gorgeous building in the middle of Boston. The views are unbelievable!!!! I will be sure to post some pictures for everyone tomorrow. I am in a row of cubicles with another three graduate interns: one from Poland, one from Jamaica and one from Russia! A very global mix of people! They each work for a different division so it is really interesting to see the kind of work they do and the kind of projects they prepare. In addition, SSgA has these fantastic lectures called “Leadership Series” where a different Executive gives a speech every week on what they do, how they got where they are today and the leadership skills they had to develop in order to be successful. In addition to that, every Wednesday, the company buys pizza for all the interns and they have what they call “Lunch and Learn”, where again, they invite an Executive to speak about the different divisions within SSgA, what they do, how they conduct business, and what a day in their lives is like. We also have the opportunity to ask questions about the different areas of finance. SSgA really cares about investing in their interns while we are there, and they really encourage us to network and speak with as many people as possible in the company. That’s all for now… I will write more tomorrow and I will post pictures of the wonderful views I get to look at every single day!! Have fun guys and stay in touch. My name is Hang Dang, a Global MBA from Viet Nam, concentrating on international finance. I started my internship on June 1 in the securities lending industry. Prior to beginning my internship at eSecLending, I worried but was excited about it because this is a very new concept and industry for me. It took me a while to understand clearly how it works. Defining the securities lending industry: securities lending is the temporary transfer of securities by one party - the lender, to another - the borrower and involves credit risk management. The borrower is required to provide collateral. That collateral is placed in other companies -> reinvestment risk control. My internship work is to assist with credit and reinvestment risk analysis on various global or supra-regional banking groups. Although they are usually rated by the major credit rating agencies such as S&P or Moody, additional research is done on each group. In conducting this type of analysis, I am trying to understand an institution’s business model and competitive strengths, financing strategies, and the economic / business environment in which they operate. Also, I look at asset quality, capital structure, liquidity, profitability, etc. and compare them with a peer group and/or versus some other standards for determining credit quality. I have learned a lot. I never believed that I could read a whole financial statement in my life. It is such a thick report! How to identify risk level is a challenge to me because I don’t have any experience in the industry so I am learning a lot. The first analysis is taking long as I am learning. My supervisor told me that he will give me a new group when I finish this one, so that I can learn as much as I can. The supervisor and the vice president of the department are very nice to me. We have some lunches and it is fun to get to know them. I took him to the Pho Pastuer, Vietnamese restaurant where, whenever I go there, I choose the same food. I miss my country’s food. I don’t have the chance to make many friends at my internship because there are not many coworkers in the area where I am except many important positions: two CEOs, CFO, some directors and vice presidents and 4 people in the legal department. Can I be friends with them? Will I get to know them? It looks like they totally focus on their work and I am totally focusing on mine. It is fine because getting professional experience is more important. But I can tell that I enjoy working there and learning a lot. I felt uncomfortable at first because my seat-back faces to the CEO and CFO’s offices and only I am in that area this week. My department is in another area because they don’t have enough space for me. I have to run between two areas so I do get exercise! I think I will lose some weight after the internship without going to the gym. Isn’t that cool? Then I told myself that I should not care who is sitting by me, and focus only on doing my job. Now I feel fine and enjoy my job. I went back to Vietnam for 2 weeks to get my visa renewed and to visit my family. It was funny that the officer did not ask me anything except “ morning, how are you and when will you graduate?” I prepared for the visa interview carefully though. Weird!!!. My investment in the Vietnam stock market and my own company in Vietnam, Amie Bags Co., which manufactures and supplies handbags, backpacks, suitcases and other fabric products are other reasons I went back home. Amie is my French name. I worked for a French company for a few years. They called me Amie “a friend” because I always smile and look happy. A lot of fun and my happy life at Suffolk and Boston made me forget my businesses in Vietnam for a while. Now I need to take care of them and give Amie products the opportunity to be here in the US. I carried two suitcases of all Amie products from Vietnam including handbags, backpacks, laptop and Ipad sleeves. It was unbelievable the custom officers did not ask me anything, even with one box of duck meat! I have been familiar with facing challenges and difficulties. Another plan If have is to take CFA level-1 test this December. It is a busy summer for me. I am very lucky on everything I do. I hope my luck continues to drive my life. Everyone around me is very nice to me, which is also part of my luck. They are patient to understand and listen to me even when my English is a little slow; and they help me out. I appreciate my lucky life and our Dean to give me the chance to be one of the Global MBAs, to have this great internship and to have met you all. My classmates all have great internships like I do. I am very happy to share what I am doing with you all. Enjoy and enjoy whatever you do! End of the First School Year and the Start of a Great Internship! My name is Konstantina Tsouroufli and I am a GMBA candidate with a concentration in International Finance. I am originally from Greece and just finished the first year of my program!! I am very excited to only have one more semester left, as I miss being in the workforce very much. It was a wonderful year however, with lots of interesting and challenging classes as well as a terrific trip to London where I had the chance to visit many famous financial institutions (State Street, Fidelity, Barclays and CMC Markets to name a few) and learn more about International Finance! I am fortunate enough to have secured an internship with State Street Global Advisors for this summer! I will be working with the Product Engineering group in the Fixed Income Division and I am super excited about the opportunity! Even though I won’t get to travel abroad like some of the other students, getting this experience in the area of finance will be of tremendous value to me and will involve a learning curve just as steep, considering my background is in engineering and operations management (don’t be fooled by the term “Engineering” in the name of the group I will be working for… it has absolutely nothing to do with Engineering I was told!). I am really looking forward to this incredible “journey”! I have to admit however that the road to getting this internship was long and with its fair share of frustrations and emotional ups and downs. Thankfully, Dean Hallberg never quit on me and encouraged me all the way. She made sure I had the right opportunities presented to me and ultimately allowed me to select the one that best fits my career focus and goals. I couldn’t be more grateful for that! It should be fun! I will keep you all posted on any exciting news! !